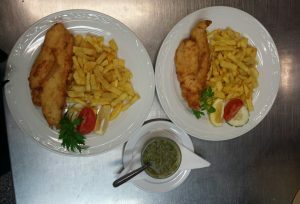 Every Thursday night and Friday lunch and dinner we serve Fish`n`Chips . Delicious loin of fresh cod in homemade beer batter,freshly cut chips and mushy peas, and our tasty tartare sauce made every week. Reservations are an absolute must, so call us to book your table.